GMS-1500 is four channel digital controller which can be connected to four (4) gas detectors. Receiving analogue continuous signal from four (4) detectors and converting it into digital signal, GMS-1500 provides various alarming and monitoring environment by micro-processor. Also, GMS-1500 converts digital signal into the 4-20㎃ standard current signal for output signal which can be transmitted to various external devices such as PLC, DDC, RECODER, and so on. 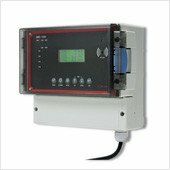 Using these functions, you can easily construct the gas monitoring system more extensive as well as more comprehensive.